Pes Planus is also known as Flat feet or Fallen arches. In normal condition, the inner part of the foot has an arch which is slightly raised off the ground. This gap is normal, especially in a standing position. People suffering from Pes Planus or Flat feet have a very low formed arch or no arch at all. Due to the lack of this arch, the feet have a tendency to roll over to the inner side while walking or standing and the feet point outwards. Pes planus occurs in almost 20% of the adult population. It is caused due to the loss of the medial longitudinal arch. It can be rigid or flexible. When the deformity is flexible, the alignment of the plantar arch can normalize. For children no more than 10 years old, the degree of ligamentous laxity on feet may lead to pes planus which can be recovered in growth for the chances of developing a strong arch. What Are the Symptoms of Pes Planus? Children with flexible flatfoot usually do not show any symptoms. Their shoes might wear out differently from normal people. For people suffering from moderate or severe case, they might exhibit more fatigue and tiredness. Their feet might get sore after standing all day. In uncommon and severe cases, the person might develop calluses on parts of the feet where pressure causes the bone to contact the floor or hard surface and there is loss of joint stability. The deformity can worsen with age and can cause mal-alignment of kneecap, bunions and rotation of knee and hip. If tarsal coalition occurs, it can cause pain in the foot. Pain in foot and ankle will not resolve after normal healing period. It can decrease motion and can be symptomatic of a more serious problem. 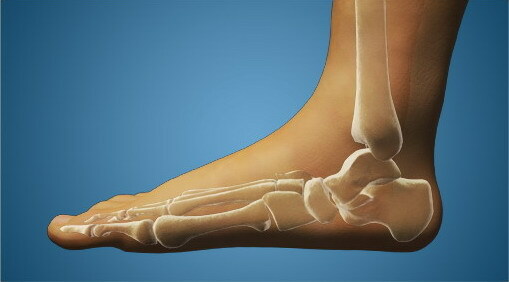 When the instep of the foot comes in contact with the ground, in standing position, they are suffering from Flat feet. During diagnosis, the person is asked to stand on toes. If the arch forms, it is a flexible flat foot, which does not require any treatment or further tests. Adults are usually asked to wear footwear which is spacious, comfortable and has a good arch support. Orthopedic devices made from rubber, leather, metal, plastic or some synthetic material can be inserted in the shoes. They help to keep the foot in a neutral position and also protect it from excessive pounding. In children, since the arch develops naturally by the age of 5, no form of correction or inserts are required. The pain experienced in the heel can be relieved by stretching the calf muscles. Stand 1 foot away from a wall, face the wall and place your palms of both the hands on the wall at chest level. Step back with one foot and ensure that the legs are straight at the knee and feet flat on the ground. Bend the knee of the leg near to the wall and press into the wall with both hands. A gentle stretch will be felt on the calf muscles. Hold the position for count of 10, switch the legs and repeat 2-4 times. The count can be gradually increased to 30 or longer. Towel curl exercise is done to strengthen the foot by using a towel and weights. Sit on a chair and place your feet on one end of a towel placed on the floor in front of the chair. Hold the towel in position with one foot. Keep the heel of the other foot firmly on the towel, curl the toes and start to pull the towel towards you. Repeat with the other foot. To increase the strength, weight can be placed at the other end of the towel. You can use 1.5 – 2.5 kg weights or even a can of fruits or vegetables.